NOTE: This project is complete as of November 16, 2018. Webpage for reference only. Welcome to the webpage for the US 41/US 141 & County B interchange reconstruction and improvement project in Brown County. PLEASE NOTE: Construction dates and closure dates have changed due to the April snow storm. Interchange construction details, schedule, ramp closures, traffic impacts, detour routes and advice for businesses located in construction work zones can be found below. This interchange reconstruction project will address traffic congestion and safety concerns at the US 41/US 141 & County B interchange by adding a left turn lane to the northbound US 41/US 141 off-ramp to County B, adding an additional through lane on westbound County B, and reconstructing all interchange pavement. A full closure of interchange ramps will take place during reconstruction. 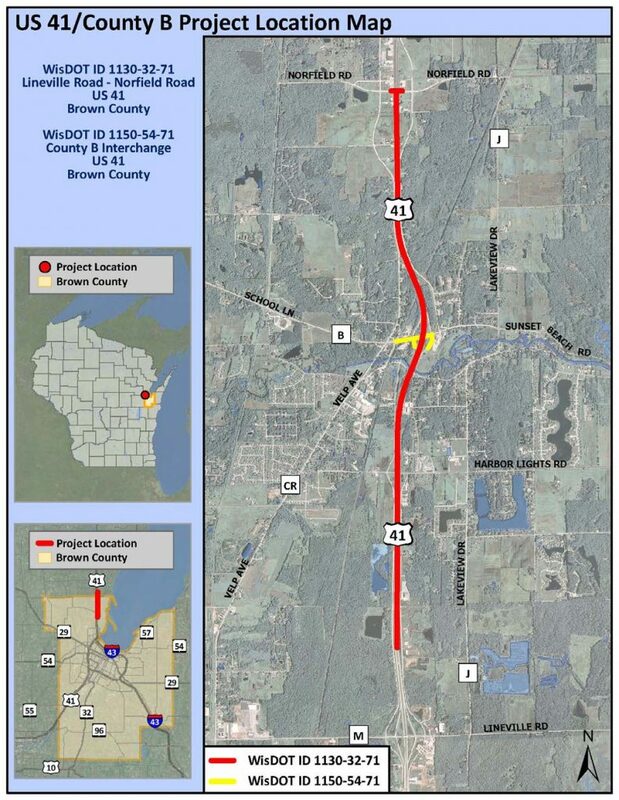 The US 41/US 141 & County B interchange reconstruction project is located in the village of Suamico (Brown County) from Velp Avenue to Veterans Avenue. A separate US 41 resurfacing project from County M to Norfield Road in Brown County will take place during interchange reconstruction. Both projects are shown on the map. May 29, 2018: Construction begins with full closure of US 41/US 141 & County B interchange and County B. A full closure and partial closure of the interchange will take place during construction. County B will also be closed during construction. US 41 will remain open to at least one lane of travel during construction. County B east of the northbound US 41 off-ramp will OPEN following the opening of the northbound ramps on June 29. County B west of the northbound US 41 off-ramp will remain CLOSED through July 27. July 27, 2018 to late August: All interchange ramps open. Various lane and shoulder closures for retaining wall work. Detour will be in place from May 29, 2018 to July 27, 2018. US 41 traffic seeking eastbound County B: US 41 to County M (Lineville Road) to County J (Lakeview Drive) to eastbound County B. After June 29, the northbound US 41/US 141 on and -off ramps will remain open, as will County B from the US 41 northbound ramp terminals to east. County B traffic seeking US 41 will be directed to use the County M (Lineville Road ) interchange south of the US 41/County B interchange to enter US 41 via County HS (Velp Ave.) or County J (Lakeview Dr.). Temporary business signing may be placed during the detoured portion of the project by filling out a business signing permit, free of charge. All temporary business signing needs approval before placement to ensure it is in a safe location and does not pose a visual distraction or traffic hazard. Temporary business signing cannot be placed on traffic control devices or state signs. Business signs attached to these devices will be removed. It is encouraged that businesses team up to have multiple businesses advertised on one sign structure versus several individual signs. This makes it easier for travelers to identify signs and find their destination. Temporary Business Sign permits are available as a fillable-form WORD download (above) or you can request one from project leader Matthew Bertucci by calling (920) 360-1130 or email Matthew.Bertucci@dot.wi.gov. Please email the completed permit as an attachment to Matt, or if you prefer to mail the completed form, please address to: Matthew Bertucci, WisDOT NE Region, 944 Vanderperren Way, Green Bay, WI 54304. Case studies that demonstrate techniques that have been successfully used in communities throughout Wisconsin. Promotional samples showing a variety of examples of how businesses have promoted their businesses during construction. This program is offered to business and community leaders as an idea source as they plan for road construction in their area. Through communication and cooperation, businesses can not only survive, but thrive, when road construction comes to town. Please visit the In This Together website here.